In this week’s Throwback Thursday, Christian Carrion takes a look at one of the most underrated gems from the golden age of game shows—giant safe and all. As discussed in a previous Throwback Thursday, the mid-70s were a particularly fertile time in terms of the creation of new game show concepts. The genre was at another one of its peaks in popularity, and producers scrambled to meet the demand of die-hard daytime viewers. In comparison with the televisual landscape of today, new shows seemingly had an easier time making it from the pilot stage to a network’s schedule. Lots of stuff was thrown against the wall—some games stuck against that wall for a long time, others slowly slid down the wall like a sticky rubber toy spider, and still others bounced against the wall with a resounding thud. Around that time, producer Ron Greenberg did his fair share of wall-throwing. A native New Yorker, Greenberg worked for Barry-Enright Productions on shows like Dough Re Mi and Tic Tac Dough, and for Merv Griffin on Word For Word and Let’s Play Post Office, before setting out to form his own production company. His first project as a producer, The Who, What or Where Game with host Art James, was a hit for NBC from 1969 to 1974. As a result of that success, Greenberg would spend the beginning of the 70s filming pilots and taking chances on various new ideas, many of which proved to be not yet ready for daytime. 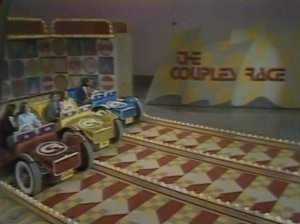 The Couples Race, for example, was a three-family game involving the exchange of prizes while traveling to the finish line in large mechanical cars. Smart Money, a CBS project, involved two contestants grabbing prizes as they scrolled by on an electronic ticker. 20 Questions was a remake of a parlor game from the early days of television, this time featuring original Wheel Of Fortune announcer Jack Clark and a panel of four celebrities. In 1973, Ron Greenberg put away the mechanical cars, the tickers, and the parlor games to create, with his partner Don Lipp, Showdown. A “hard quiz” in the style of The Who, What or Where Game (or its lead-in on NBC at the time, Jeopardy! ), Showdown was a game in which three players competed to answer questions in various categories worth from one to six points. Throughout the game, certain score milestones awarded a cash prize to the first player to reach them ($25 for the first, and increasing by $25 increments as the game progressed). However, a player could only reach that milestone, called a “payoff point,” on the nose. This meant that if the payoff point was 8, for example, and the player in control had six points, choosing a two-point question would lock his or her opponents out of the question if they each had a score of seven, since the two points would put them over. This innovative game element allowed for seemingly unlimited possibilities of blocking and counter-attack combinations, adding an uncommonly rich layer of strategy to an otherwise straightforward quiz. After two rounds of play, a 90-second speed round determined the top two scorers; the third player was eliminated from the game. The remaining two players played a round the same way as before, but this time, there were only three categories to select from, worth one to three points. All players kept the cash they earned from hitting payoff points throughout the game, but the first player to reach the payoff point of seven won the game and the right to go to the bonus round. 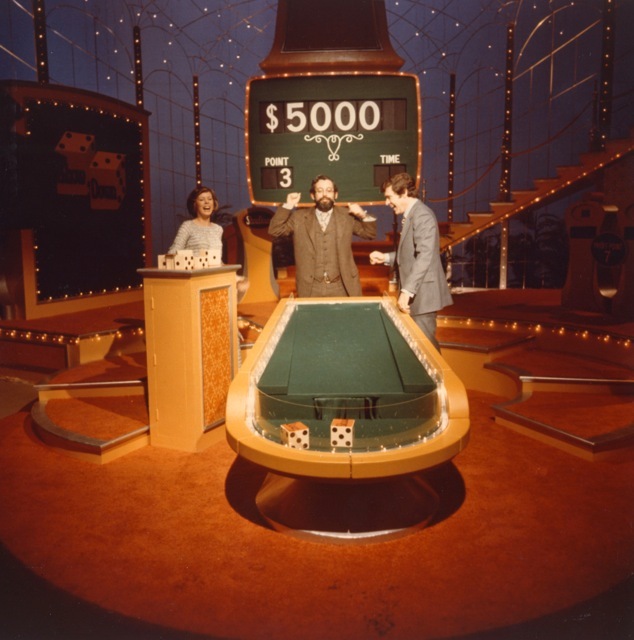 The original bonus round of Showdown involved a huge, mirror-laden safe that served as the centerpiece for the set at ABC Television Center. The large dial in the center of the safe was numbered 1 through 6, and the winning contestant had to unlock the safe by figuring out the correct combination. Waiting for a successful player on the inside of the safe was over $10,000 in cash and merchandise prizes. Once the pilot was in the can, Greenberg and company decided that the safe-cracking bonus round wasn’t intriguing or exciting enough to complement the thrilling, strategically rich main game. Showdown pilot #1 was a no-go for ABC, but soon after, Greenberg would take his game of knowledge and strategy from the bank vault to the dice table. The second pilot, also titled Showdown, was hosted by Jim Peck, who also found success as substitute host for David Hartman on Good Morning America. Peck, a Milwaukee boy, had entered into a contract with ABC to host three game shows, and this was his first—he would later find fame as host of ABC’s Hot Seat and Second Chance and the syndicated Joker’s Wild, and infamy as the host of 3’s A Crowd before landing the role of the whispering reporter on Divorce Court in the 80s. On a lush, elaborate set designed by Ron Baldwin, complete with spiral staircase, the three Showdown contestants played the same game as before—answer questions, hit payoff points, choose wisely and hold back your opponents from taking the lead. This time, however, the winning contestant ascended the stairs to a perch at the top of a long, downward-sloping dice table. Model Heather Cunningham (who, a few years later, would star as Dee Stewart in a 1978 episode of As The World Turns) assisted the player by handing him two dice—normal dice, save for the facts that they were greatly enlarged and that the sixes on each were replaced with the words “Show” and “Down.” To start, drums rolled as the contestant took one lucky throw of the dice, a roll of “ShowDown” redeemable for $10,000 in cash. If unsuccessful, the player was given 30 seconds to roll as many dice as he could, earning $250 and an extra five seconds of rolling time for each roll that was identical to that first one. Rolling ShowDown this time was worth $5,000. Jim stood downstage and called out each roll as it landed in the well at the bottom of the dice table, pushing each pair into a hole built into the set piece so as not to clutter the play area. 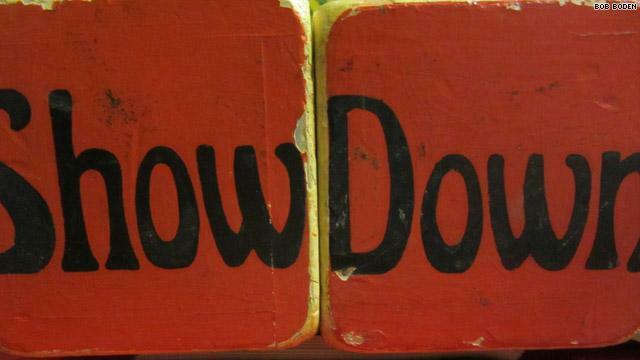 Heather stood by with a pair of dice after each roll, thanks to a tall device filled with dozens of pairs of Showdown dice (only one pair is known to exist today, in the collection of game show producer Bob Boden). This bonus game proved to be much more exciting; the audience screamed and cheered as the contestant sent dice zooming down the table, and finally exploded once the five grand was won. With a successful pilot under its belt, The (newly-retitled) Big Showdown premiered on ABC at 2:30pm on December 23, 1974, right before another Greenberg property, The Money Maze. Unfortunately for the show and its fans, its debut couldn’t have come at a worse time. 1975 is a red-letter year for quiz shows; it was determined by those brilliant network executives that audiences didn’t want to be stumped anymore. They wanted word puzzles, rebuses, stunts, celebrity secrets—you know, lightweight stuff. Slowly but surely, networks began to clean house. On NBC, Jeopardy! and Jackpot got the ax, CBS let go of The Joker’s Wild, and on July 4, 1975, two weeks after the exit of the Hatos-Hall produced Split Second and Goodson-Todman’s Password, ABC said goodbye to The Money Maze and The Big Showdown. The final episode of Showdown saw announcer Dan Daniels introduce the host by his full name, James Edward Peck, to a thunderous standing ovation from the audience that lasted almost two solid minutes. 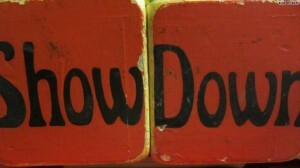 Despite a short seven months on the air, The Big Showdown had a lasting effect on its viewers—nearly four decades after the last pair of Showdown dice fell into the well, game show fans the world over have expressed a fondness for the game that isn’t even matched by some of the heavyweight shows. Producer Ron Greenberg also saw some more potential in the game—he reportedly shopped around a revival of the show in the early 2000s, to no avail. 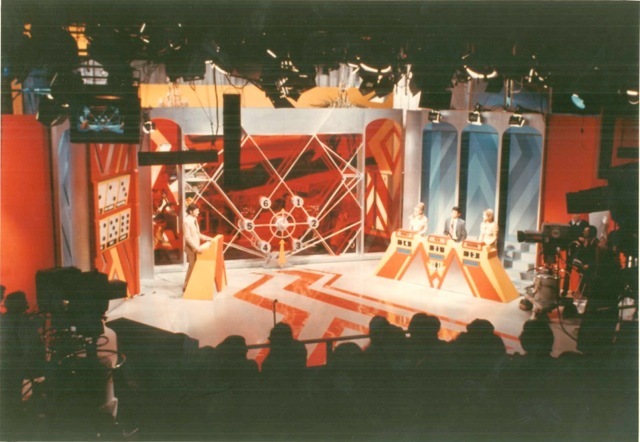 More recently, the rocking Score Productions-created theme song was unearthed by Terry Wilkie of the Museum of Television Production Music, to the delight of game show and music lovers all over the Internet. What The Big Showdown lacked in longevity, it more than made up in substance. To this day, not many game shows have hit the airwaves that have displayed the same amount of intrigue, suspense, excitement, and downright unique gameplay, all rolled into such a gorgeous package delivered by one of the most charming hosts around. If this interest in that old quiz show, as well as scores of fan recreations, YouTube tributes, and Adobe Flash games, are any indication, The Big Showdown will have a seat at the big game show dice table for a long time to come.